Operator-control unit. German, English, French, Dutch, Italian, Spanish language support. Operator-control unit. English, Swedish, Danish, Norwegian, Portuguese language support. Operator-control unit. English (GB), English (USA), Spanish, Portuguese (Brazil), French language support. Operator-control unit. English, Russian, Polish, Hungarian, Romanian, Czech language support. Connection plugs with screw terminals. The BCU 570 controls the fan, monitors the combustion media air and gas, controls pre-purge and moves the butterfly valve to pre-purge and ignition position. Once the BCU 570 has started the burner, it issues the enable signal to the external temperature control. 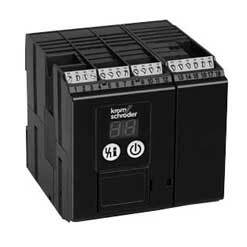 Mains voltage: BCU 570Q: 120 V AC, -15/+10%, 50/60 Hz, ±5%, for grounded or ungrounded mains. Power consumption: Approx. 3 W/5.5 VA plus power consumption per AC input of approx. 0.08 W/0.2 VA.
Mains voltage: 120 V AC, 50/60 Hz; No valve-proving system; Capacity control Modulating with IC interface; connection plug with screw terminals. Mains voltage: 120 V AC, 50/60 Hz; No valve-proving system; Capacity control Modulating with RBW interface; connection plug with screw terminals. Connection plugs with spring force terminals, 2 connection options per terminal.